- The seeding depth & seeding quantity can be adjusted. In the simplest of words sowing is planting seeds. Rye, wheat and oats are among the main field crops which are sowed. There are a lot of factors to be considered when it comes to sowing; depth and spacing being the most important ones. 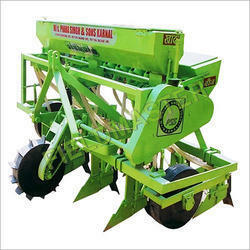 Promise seed sower machine is suitable for cultivated farm. It is widely used for sowing seeds like Cotton, Maize, Groundnut, Castor seeds, Soyabean, Rajma, Peas, Black Gram, Grams, Limabeans etc. Reckoned amid one of the credible market names, we are keenly betrothed in offering to our patrons Automatic Seed Drill. - Length of Main frame 85 Inch, Increase Length 85 Inch to 112 Inch. Owing to our years of industry experience and precise knowledge of this domain, we are offering an outstanding assortment of Paddy Sowing Machine. This product is used to make lines for seed sowing and potato sowing and used to cover up also. This is manual tool with high quality ! - Available at industrial leading prices. Ramsons Impex Zero Till Multi Crop Planter is used for sowing bold grains like maize, groundnut, peas, cotton, sunflower, wheat etc. On tilled field. The planting discs for different crops can be changed without dismantling the seed hoppers main shaft. Missing of grains and grains damage is negligible. Fertilizer can be used simultaneously according to requirement.